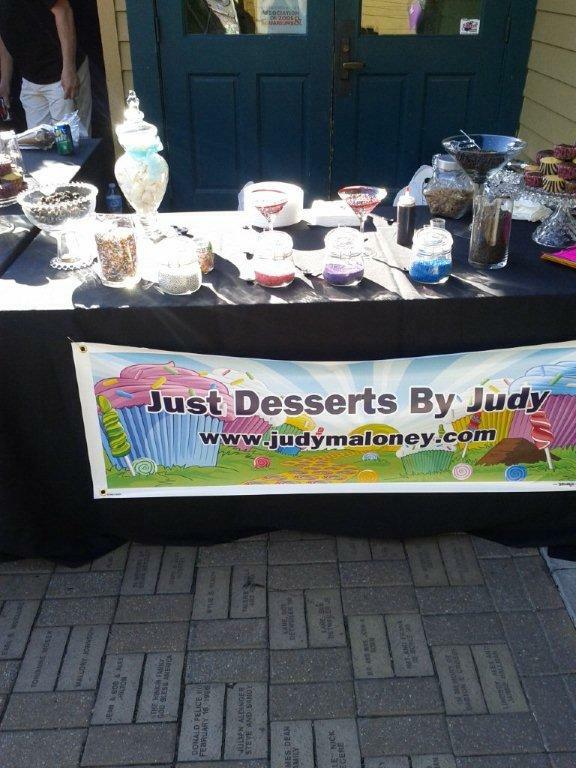 JUST DESSERTS BY JUDY NOW OFFERS a CUPCAKE BAR TO MAKE YOUR PARTY EVEN MORE MEMORABLE! 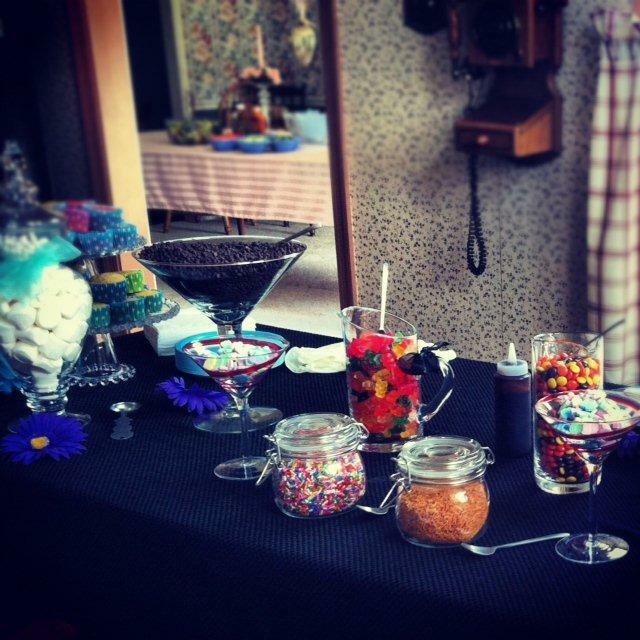 GUESTS OF ALL AGES WILL SHARE IN THE DELIGHT IN DESIGNING THEIR OWN TREATS TO COMMEMORATE YOUR SPECIAL OCCASION! CUPCAKE BARS ARE A WONDERFUL SURPRISE FOR YOUR GUESTS! 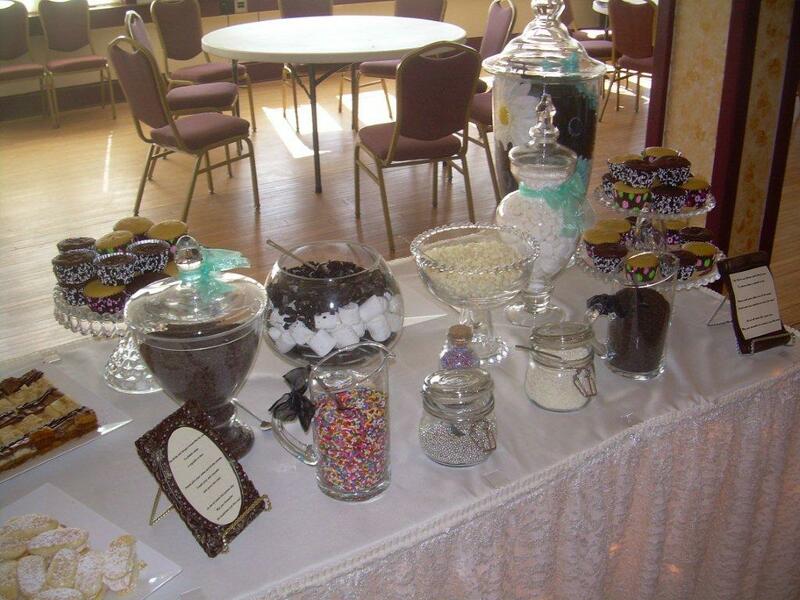 THE BAR CAN BE FEATURED AS A STATION FOR YOUR MAIN DESSERT, A FAVOR TABLE, OR JUST BECAUSE! GREAT FOR ANY EVENT, PARTY, OCCASION, GET TOGETHER- BIG OR SMALL! frosting and they can choose all the toppings the cupcake can handle! If you don't see something on our menu, feel free to ask and we will see if we can accomodate your needs. The pricing includes the delivery, setting up at your event, 2 hours of service, the cupcake bartender, all the cupcakes (regular size) and the fun stuff to go along with it. It also includes napkins, bag or box to take your extra cupcake home if you wish and break down! Literally, you don't have to do a thing, but show us where to set up. YOU CAN MAKE THIS AS ELABORATE OR SIMPLE AS YOU LIKE! YOU CAN ADD ADDITIONAL FLAVORS, FIXINS, FLAIR (CUPCAKE JEWELRY) THAT COINCIDES WITH YOUR THEME, FILLINGS, ETC. Vanilla, chocolate, red velvet, lemon, snickerdoodle, banana, vanilla with chocolate chips, carrot, cookies and cream, strawberry, chocolate ancho chili, marble, peanut butter, smores. Vanilla buttercream, chocolate buttercream, marshmallow creme, lemon whipped cream, cream cheese, caramel buttercream, coconut buttercream, chocolate cinnamon, peanut butter buttercream, mint chocolate chip buttercream, oreos and cream. Chocolate mousse, vanilla mousse, peanut butter, caramel mousse, lemon mousse, raspberry mousse, strawberry mousse. Whipped cream, chocolate sauce, caramel sauce, Gummy bears, M & M's, rainbow sprinkles, chocolate sprinkles, mini chocolate chips, miniature marshmallows, oreos, Reese's pieces, Reese's peanut butter cups, gummy worms, Swedish fish, sour patch kids, toasted coconut, pixie sticks, pop rocks, raisinets, whoppers, jelly beans, walnuts, non-pariels. For Children's Parties: Everything is the same with the addition of plastic aprons, plates and napkins for the children to participate in decorating their own cupcakes. The cupcake bartender will help the children with their cupcakes, but for the most part they do their own.